银顶旋转餐厅位于酒店49楼，分机号码是6266/6267/6268，它是济南最高的一家旋转餐厅，您在用餐的同时，可将泉城美景尽收眼底。餐厅装饰风格既富丽堂皇，又静谧优雅；餐厅主要以亚洲风味美食为特色，除了每天早中晚3次的盛大自助餐和提供单点服务，还特别提供酒店自制的面包，甜品，冰激凌和巧克力; 还有各种口味、风格的咖啡，为您的小憩增添甜蜜的色彩。开放式的动感厨房让您亲眼目睹精彩而又精益求精的中式，日式以及西式美食制作过程。餐厅还定期举办主题美食活动，让您足不出户即可享尽全球美味。/ Silver Sky located on the 49th floor, extension number is 6266/6267/6268, reflects a blending of elegance and magnificence and leads you to a journey of authentic home-style and innovative Asian cuisine. 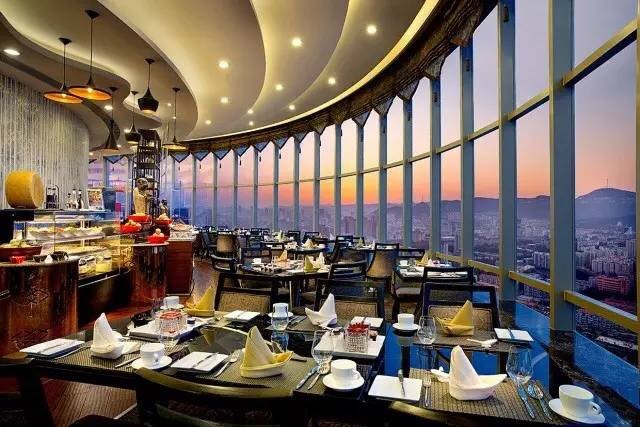 It's the highest revolving restaurant in Jinan. In addition to the fine buffet offerings 3 times per day and a-la-carte service, the hotel also provides homemade bread, exquisite desserts, ice cream and chocolates and a different variety of Coffee, which make your life sweeter. 2 dynamic open kitchens allow you to witness the exciting and excellent specialty the process of producing Chinese, Japanese and Western cuisine. 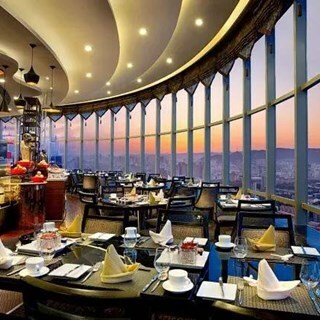 Silver Sky regularly organizes promotions, so you can enjoy all kinds of cuisines over the world without leaving home.